Often there may be occassions where a photographer is required to supply the identical composite page but in two or more different sizes. In school photography for example it may be necessary to provide an 8"x10" composite to individual students while also supplying the school with larger year level composites or even a whole school composite. Create a composite page layout template in the normal way at any of the required sizes. This size becomes the "default" size that will be used when forming the page unless otherwise specified. 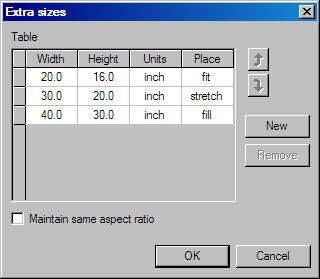 It is important for the user to understand how the Fit, Fill and Stretch options work when defining extra sizes. 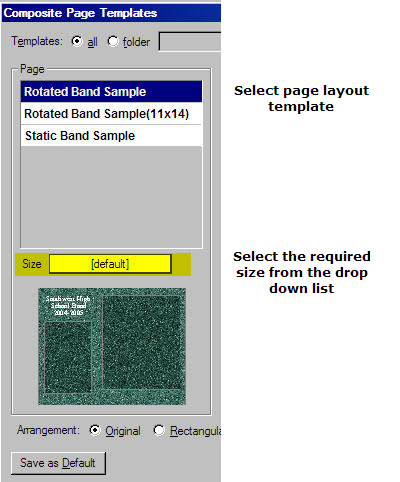 Consideran 8"x10" (horizontal) composite page layout. This is in the 4:5 aspectratio. It will serve as the "default" size. Another size is needed,16"x24". This is in the 2:3 aspect ratio. In other words it is longerthan the default size. In this scenario the user must decide how thetemplate objects are to be placed on the extra size layout. Fit: Scales to fit the shortside (the 8"side). This means the long side (the 10" side) will bescaled up to 20". Since the extra size is 24" lomg the Fit option willleave 2" of extra space on the left and right sides. Fill: Fills the long side (the10" side) essentially scaling it up by a factor of 2.4. Applying thissame scaling to the short side (the 8" side) will cause it to be 19.2".Since the extra size defintion is 16" high, using the Fill option inthis scenario will cause the top and bottom to be cropped. Stretch: Will stretch theobjects on the page to fit both the vertical and horizontal planes.Note this does not cause distortion of images and text since thetemplate objects are stretched before the data and images are placed. The"place" options are only applied when the aspect ratio of the extra size isdifferent to that of the default size. When the two are in the sameaspect ratio these options have no effect.